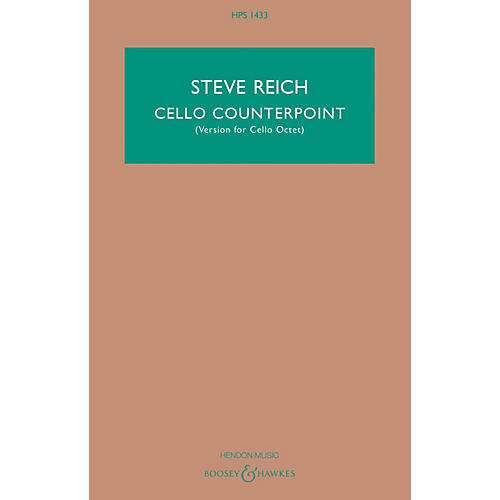 Cello Counterpoint (2003) is scored for eight cellos, and can be played by a soloist with the other parts pre-recorded. This tape is available from the Boosey & Hawkes rental library. Alternately, the piece can be played by a Cello Octet. (There are differences in distribution of parts between the two versions.) The piece is in three movements: fast, slow, fast. The first and last movements are both based on a similar four-chord cycle that moves ambiguously back and forth between C minor and E-flat major. This harmonic cycle is treated extremely freely however, particularly in the third movement. The second, slow movement, is a canon in E-flat minor involving, near the end of the movement, seven separate voices. The piece is a little more than 11 minutes in duration, and was co-commissioned by the Koussevitzky Foundation in the Library of Congress, the Royal Conservatory in The Hague and Leiden University, for cellist Maya Beiser.